Sugar cookies. Name someone who doesn’t love them. I bet you can’t. What’s not to love about sugar, butter, and more sugar? Nothing. Unless you are allergic to dairy and prefer to eat whole grain flours and less processed sugar. 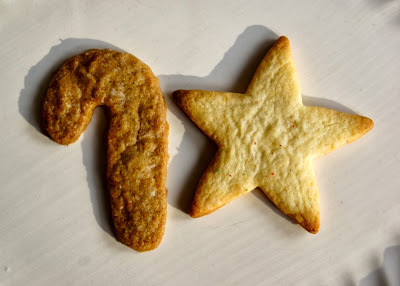 I have been making my recipe for classic sugar cookies for quite some time now and would have a lot of angry friends and family if I ditched it completely. I just added a new sugar cookie to the mix, it’s a contemporary spin on the classic dough and includes nutty spelt flour, molasses-y coconut sugar, and sweet coconut oil! 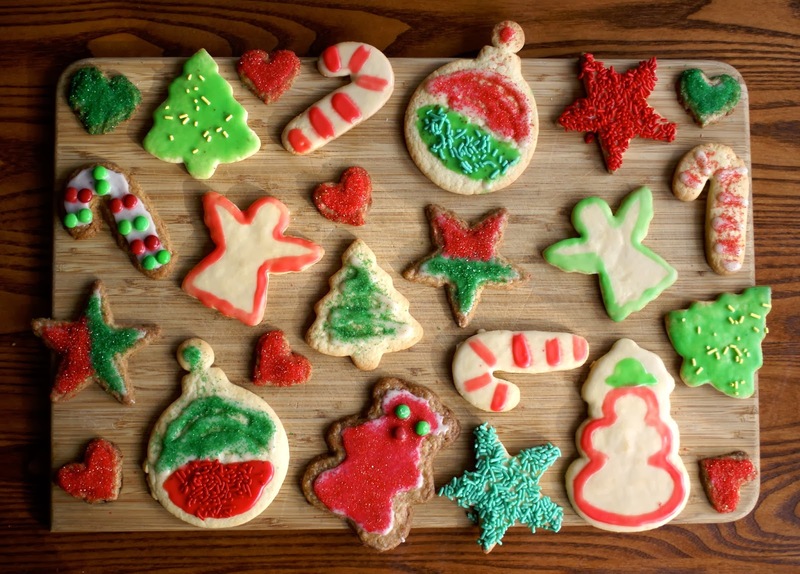 There is something magical about making Christmas sugar cookies. 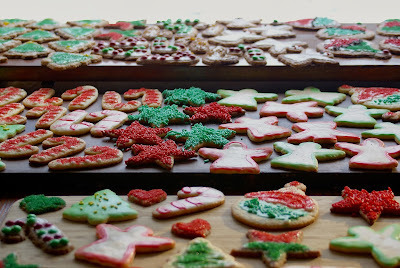 The delicious smell filling the house and cute Christmas shapes always puts me in the spirit of the holiday. I always make an absurd number of sugar cookies and give them away as gifts. 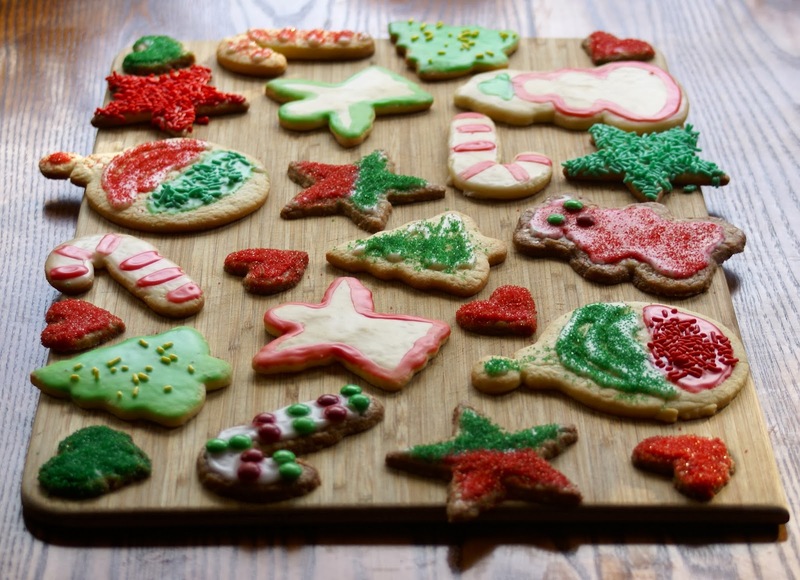 Saying “Merry Christmas” with a delicious edible treat is hard to beat! 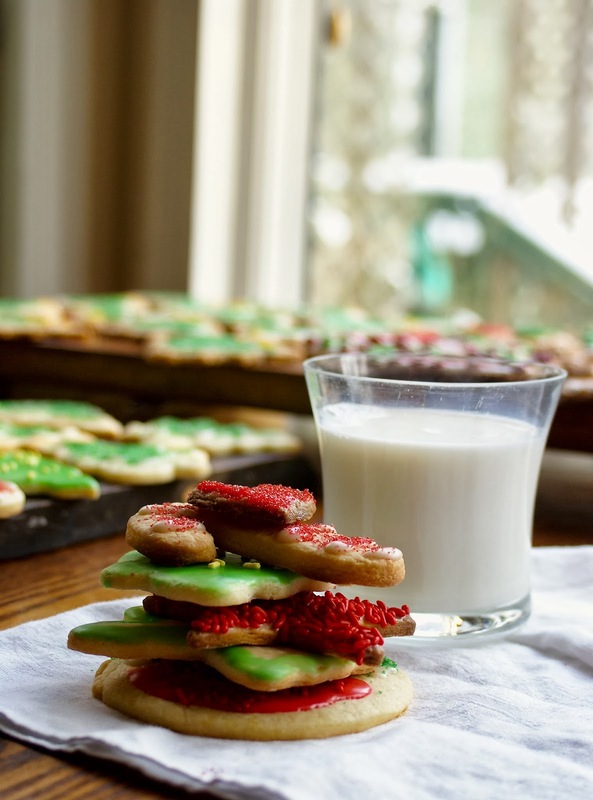 The recipe for classic sugar cookies pretty much speaks for itself. It is the most simple and scrumptious recipe you can find! While I like to pair these sugar cookies with vanilla frosting to dress them up, they are just as good plain. I am really excited about how the new cookies came out. They are crispy and rich with a slight almond flavor. Heaven in cookie form. After frosting them with orange nutmeg spiced frosting, I had to resist eating them all. There is only one difference between the two recipes. 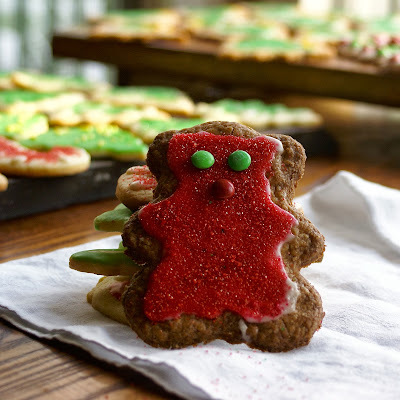 The coconut oil in the contemporary sugar cookie makes the dough much more difficult to roll out, so you have to briefly microwave the dough to soften it up. I recommend making both types and doing a taste test. Both are delicious in their respective ways, and do you really need a reason to make more cookies? I am wrapping both types of sugar cookie in a basket with my almond citrus biscotti and a candy cane reindeer to give to my friends and family. 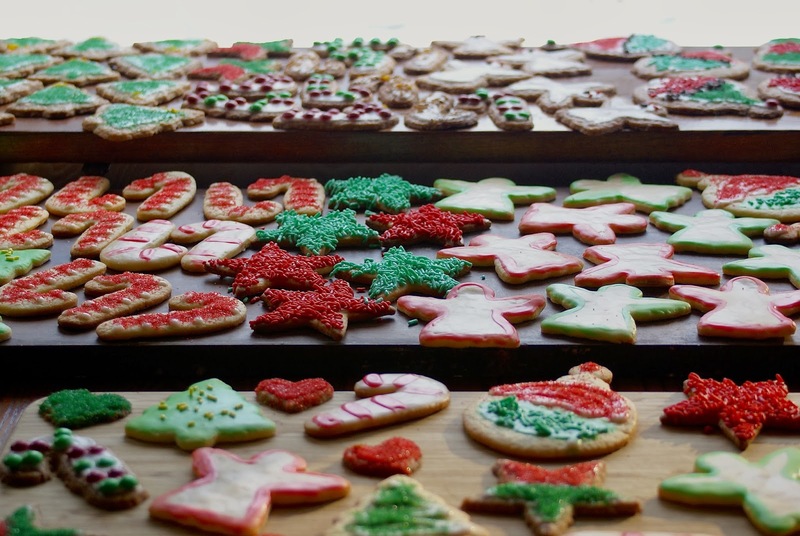 So throw on some Christmas music and get baking! This recipe makes about 24 medium sized cookies. 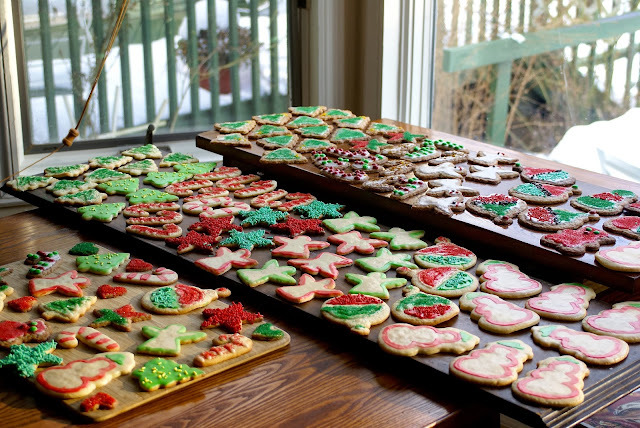 The amount can vary based on the size and shape of your cookie cutters. 1. In the base of a kitchen aid, whip butter on a medium speed for about a minute so it is light and fluffy. Hand held beaters will work as well. Add sugar, and beat another minute. Add eggs, one at a time, beating 30 seconds after adding each egg. Add vanilla extract and mix well. 2. Whisk together flour, baking powder, baking soda, and salt. Slowly add dry ingredients to wet ones. Mix until just combined. Form dough into a ball, wrap in wax paper, and put in the fridge for 3 hours to overnight to chill. 3. Preheat oven to 400 F. Line two baking sheets with parchment paper. Cut chilled dough in half, and leave half the dough in the fridge. Form dough into a disk shape, and place on a surface sprinkled with powdered sugar. Sprinkle the top of the dough with powdered sugar, and roll out until dough is about 1/4 an inch thick. Use desired cookie cutters to cut out the dough. Place cookies on lined baking sheet. Bake for 7-9 minutes or until edges start turing brown. Make sure to pay attention; these cookies can burn easily! Cool on a wire rack. Wait until cookies are completely cool (about an hour) before icing them. Whisk together powdered sugar and cornstarch. Add vanilla extract and 1 Tbsp almond milk and mix well. Slowly add more almond milk, until a thick yet spreadable consistency is reached. 1. In the base of a kitchen aid, whip coconut oil on a medium speed about a minute so it is light and fluffy. Hand held beaters will work as well. Add coconut sugar, and beat another minute. Add flax-eggs and beat for 30 seconds. Add almond extract and mix well. 2. Whisk together flour, baking powder, baking soda, and salt. Slowly add dry ingredients to wet ones. Mix until just combined. Form dough into a ball, wrap in wax paper, and put in the fridge for an hour or so to chill. This dough can be kept in the fridge overnight as well. 3. Preheat oven to 400 F. Line two baking sheets with parchment paper. Take dough out of the refrigerator and cut it in half. Microwave half of the dough for 10 seconds. Mold dough into a disk shape and roll out on a surface sprinkled with powdered sugar (or flour). 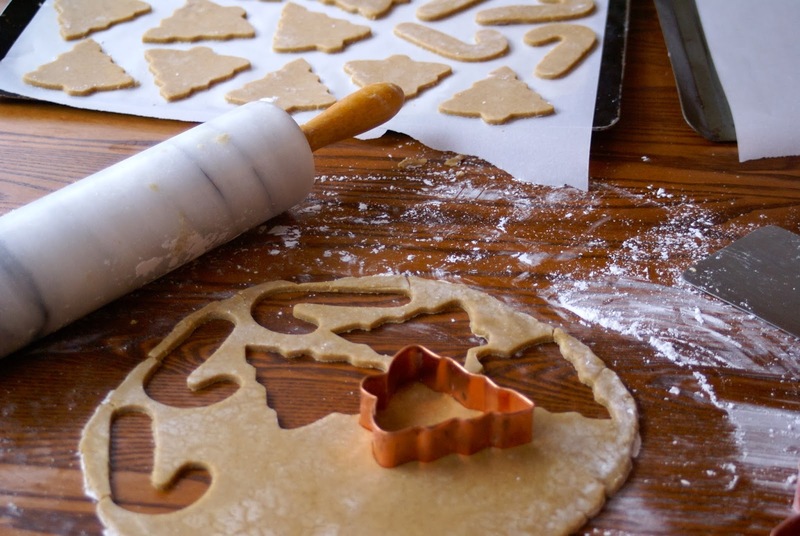 Use desired cookie cutters to cut out the dough. Place cookies on lined baking sheet. Bake for 7-9 minutes or until edges start turing brown. Make sure to pay attention; these cookies can burn easily! Cool on a wire rack. 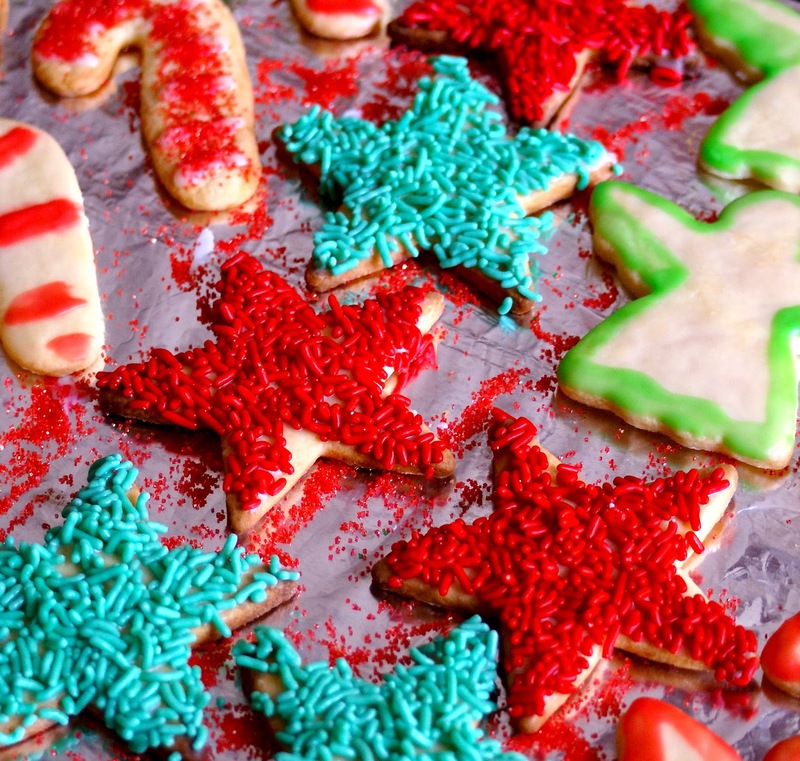 Wait until cookies are completely cool (about an hour) before icing them. Whisk together powdered sugar, cornstarch, and nutmeg. Whisk in almond milk, orange juice, and orange zest. If necessary, slowly add more almond milk until thick yet spreadable consistency is reached. You have made an insane number of cookies! Wow.